KEE Kreations’ mission is to offer products which are God-inspired designs, created to encourage, have special meaning, be used as tools for healing emotional wounds, for personal growth, to entertain, and provide simple joy to our customers. 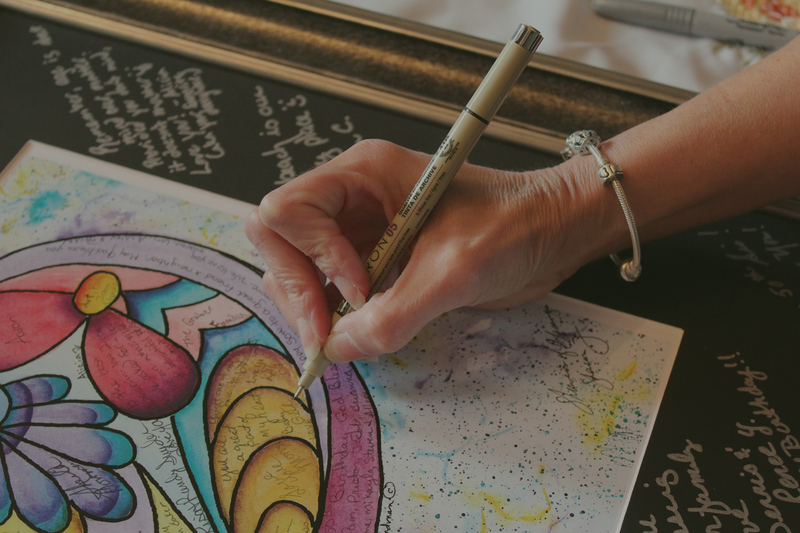 KEE Kreations has been presenting quality art since 1985, with an emphasis on personalization and unlocking the door to meaningful aesthetics for customers all around the country. Click the arrow to the left for more information. Hey! Do more than just admire KEE Kreations art – take it home. DON'T MISS OUT ON THE CHANCE TO OWN ONE OF OUR EXCLUSIVE PRINTS! Say hello to interactive art! KEE Kreations craves your personal touch. With charming nooks and crannies and ample writing space, they are tailor-made for you to personalize and enjoy at a variety of special occassions. All you need is a pen and some special words to share with friends and loved ones. ...MANY THANKS to you and the artist for such a PERFECT gift. It surrounds me with hugs every time I look at it (the pictures were taken from my desk) - so that's often! I received it (Teal, Rooms in My Heart) and it is even more beautiful than it appeared online! I found KEE Kreations during an online search for retirement gift ideas, and it will be used for guests to sign at a celebration for a dear woman who is retiring after 34 years with our company. An update - The retirement celebration took place this week and I can't count how many people made complimentary remarks about this wonderfully unique gift. And our retiree intends to rearrange her wall art to give this a special place. Thanks again! While planning our wedding, we fell in love with the idea of using KEE Kreation's Wisdom Tree as an alternative for a signature book. I'm not exaggerating when I say the tree became a center piece to the wedding! It gave such a special flair to our perfect day, and everyone loved it. It was a unique way for all of our loved ones to give us words of advice as we start our new life together. Karen and everyone at KEE Kreations are a delight to work with and made our wedding all the more special. I would recommend their Interactive Art for anyone's special occasion, or simply in their home. We received one of your beautiful Wisdom Trees as a wedding gift. The moment we opened it we were touched by its symbolism & knew it was something we'd cherish. Our guests took such care to fill it with hopeful, inspired, clever and often funny personal sentiments. Today it hangs prominently in our home where it will forever remind us of all the love and support that we felt on that incredible day. Thanks, Karen! What a great idea! I love being able to have the names and thoughts of people who have taken time to share with me, and to top it all off, I can hang it on my wall and treasure it for years to come! I was just honored at a retirement party and one of your prints was used for my co-workers to sign. I love, love it. It is a keepsake that I will cherish for years. The print is of high quality and done so nicely it can be hung in your home. Presenting quality art since 1985, KEE Kreations emphasizes personalization and unlocks the door to meaningful aesthetics for customers all around the country. KEE Kreations often uses packaging recycled from other local businesses! It's a Win, Win, Win Situation for KEE Kreations, the other companies, and our planet. © 2015 KeeKreations. All Rights Reserved. | Website by MCPInteractive.